Merry and Happy Christmas in July to you! Our niece stayed overnight last night - always such a pleasure. in the garden and have ourselves a lovely garden tea to celebrate! and give out cards and gifts. 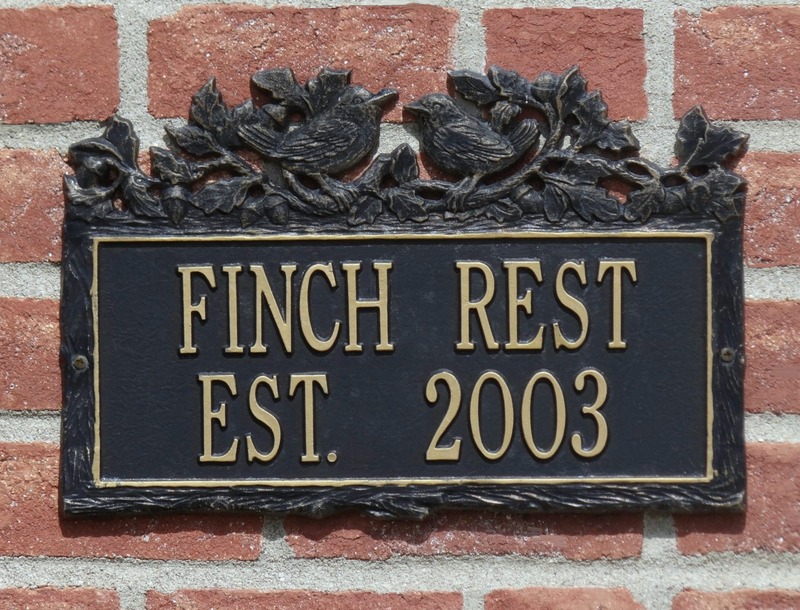 and have special holiday signage with sales. which made it super easy to do it this time. Scones with clotted cream, lemon curd and ligonberry jam, yum. I really needed a strong jolt after this non-stop week! We had iced water in the goblets but hadn't filled them when I took this shot. in our covered porch in the background. 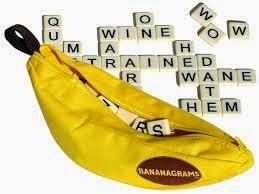 Spot It and Banana Grams......all good for our brains. these are three of our very favorites. and took this picture for the blog! I simply dolled it up Christmasy with PicMonkey. I think she and I are both feeling quite festive today! she won't want to do this with her Aunt Shell anymore. 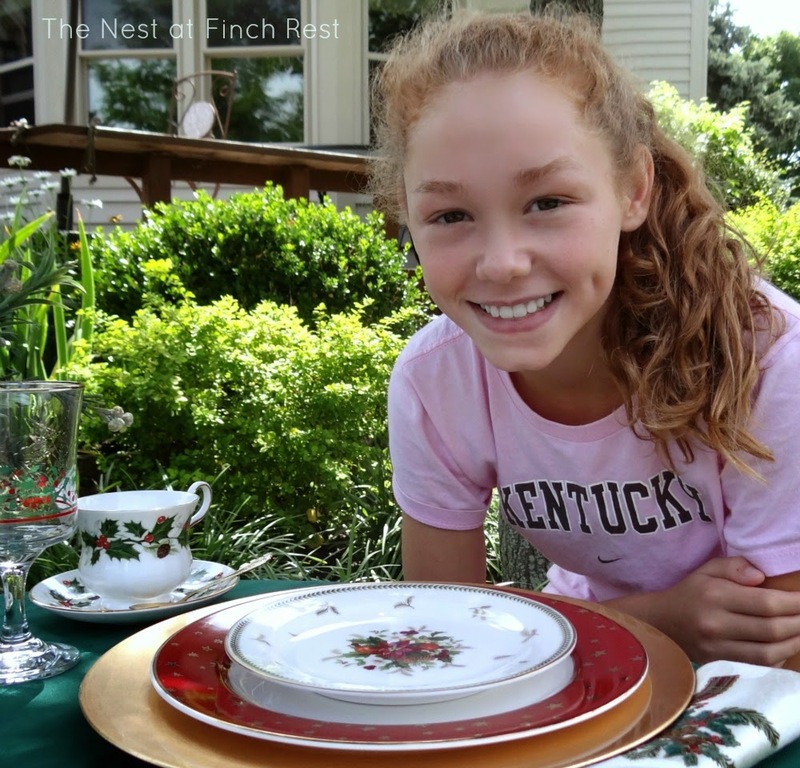 sweet, pretty, fun and helpful teatime niece, Reagan. As always, thanks for your visit! Merry "Christmas in July" to you and yours! That looks like so much fun and what a great idea! The tea table looks so pretty! 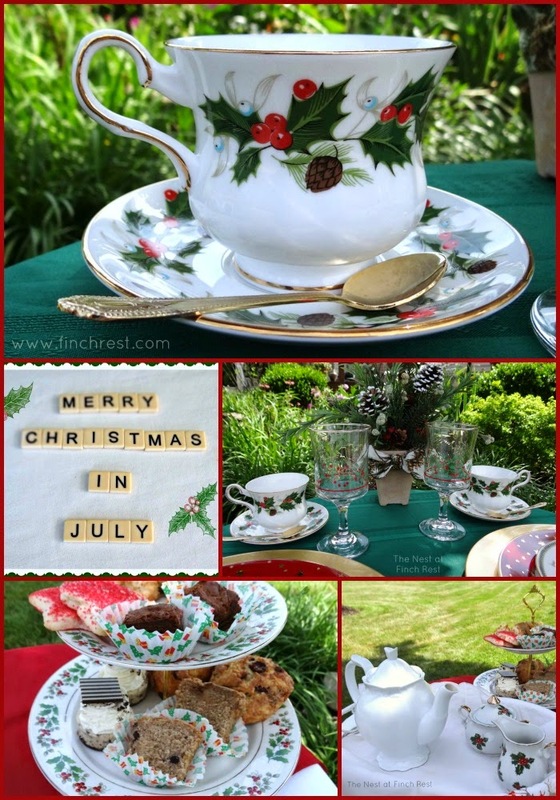 I love your Christmas in July tea! It looks like a lot of fun and having sweet Reagan to celebrate it with you, makes it even better! She's a real beauty and what fun this was for her! Very clever and your garden is really nice as well! 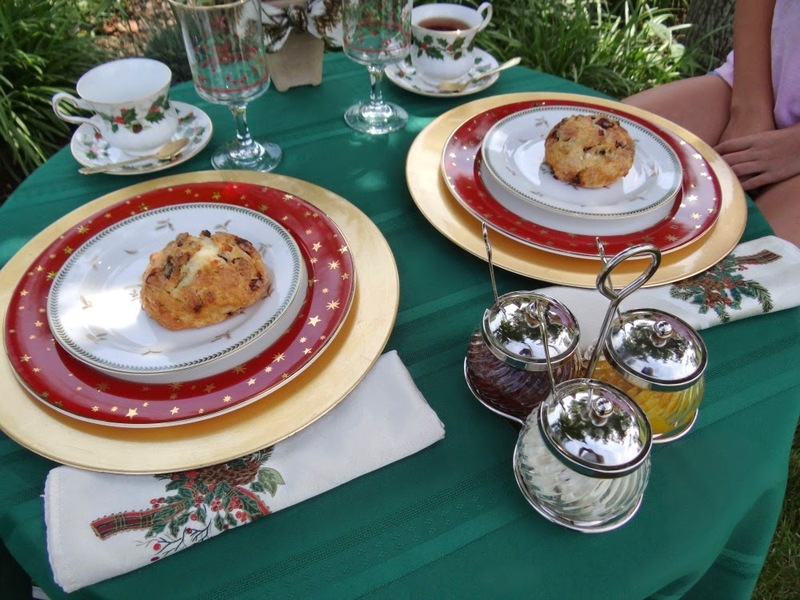 ..and a very merry Christmas in July to you too...The table looks delightful and the scones, a must have for afternoon tea looks delicious. Is the cup and saucer Royal Albert? Thank you for sharing. 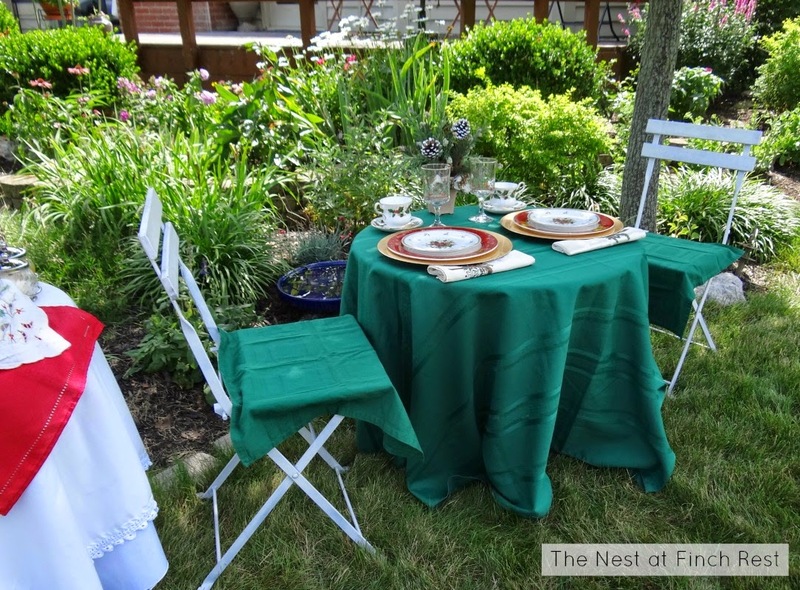 How lucky you both are to have spent such sweet quality time together, lingering over the perfect tea party, in a pretty garden, surrounded by summer's gorgeous gifts! Sigh....makes me miss my daughter even more! Happy weekend, my friend! How sweet! Your niece is adorable, and I love that she's into the spirit with you. Happy Christmas in July! I love that you had three teas in one week! And that you seriously celebrate Christmas in July. What a pretty table (like the chair covers!) and such a pretty niece. She will never forget your tea parties even when she no longer gets excited about them. What fun memories for you and your darling niece! I love this great idea, Michele. 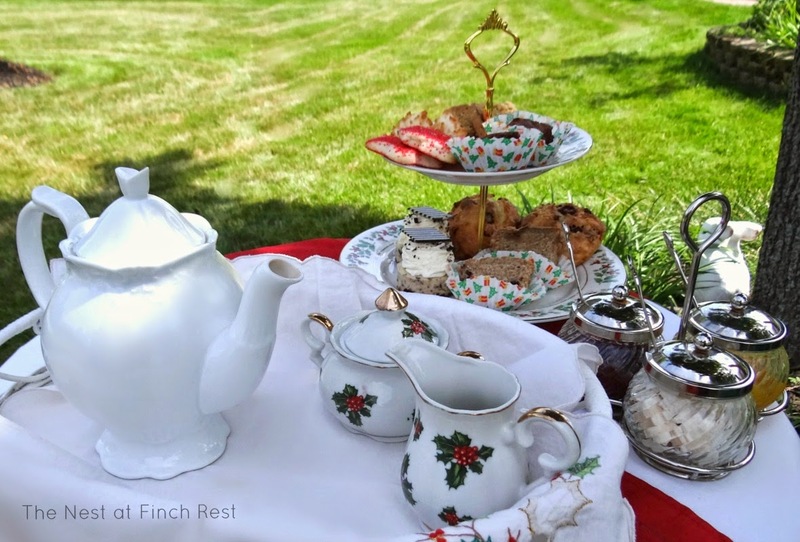 What a wonderful Christmas in July tea! 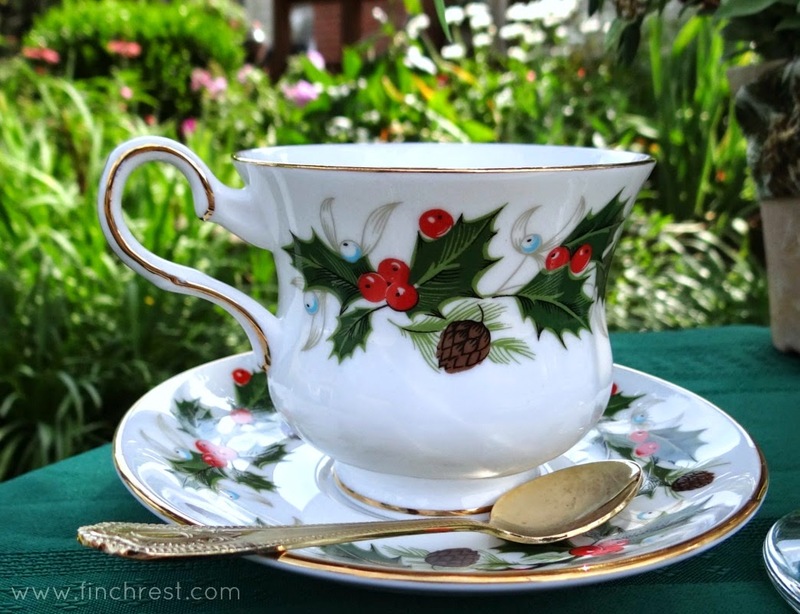 Beautiful dishes, in particular the pretty holly teacups! Those water goblets are a great touch too. The food looks terrific! 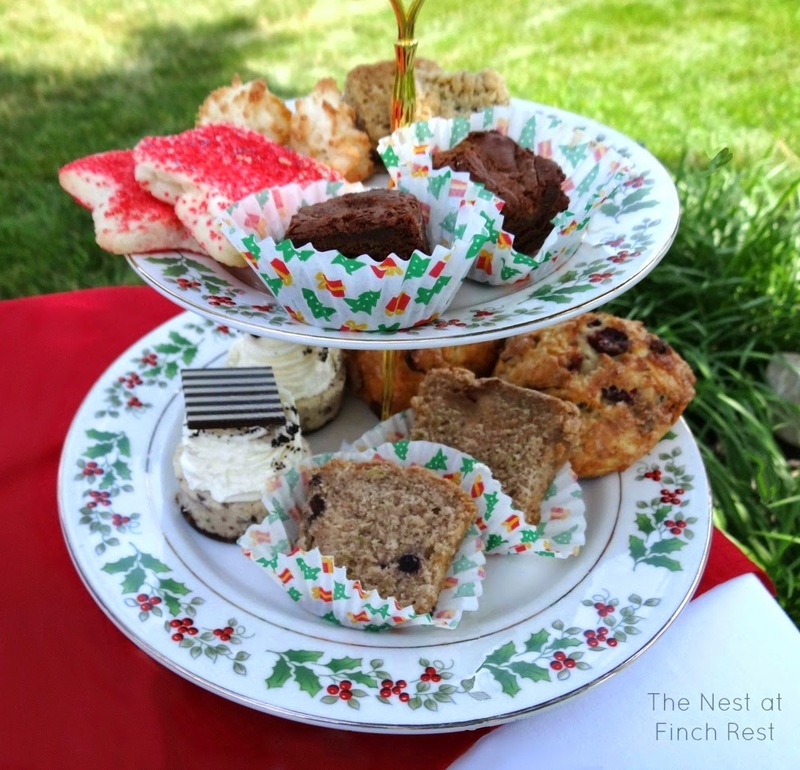 I really liked the Christmas touch with those cupcake liners--what a great idea! 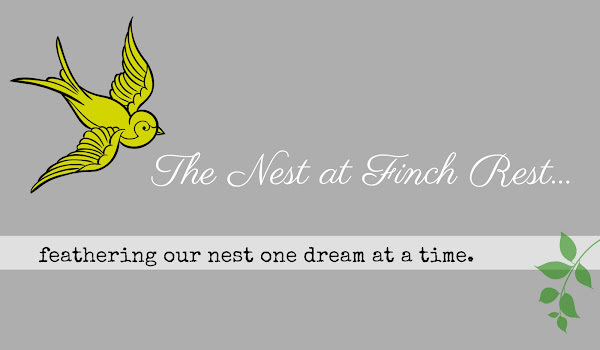 I'm your newest follower now too :) Thanks for stopping by my blog this week! Michelle, your post made me smile. What a darling niece you have. Great to have a tea party with her. Glad you have nice weather to have teas outside. Love both of your tables and all the goodies. I am afraid you would melt in our Alabama heat. You have a gorgeous backyard. Loved seeing it. Enjoy your weekend. Great idea! 2 things that should happen all year round...tea and Christmas! Love it! Sweet to have this time together. Making precious memories. Lovely Christmas in July setting. This s how we celebrate Chrstmas here in OZ, outdoors and very summery with lots of cool refreshing drinks. But of course I always enjoy my tea regardless of the weather. Your niece is such a sweetie. Enjoy it while it last, coz they grow up so fast. 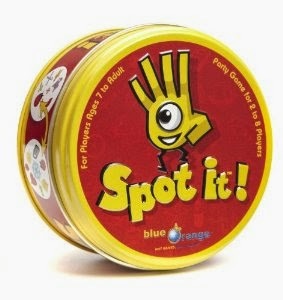 How much fun is that? 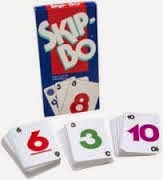 And we love Skip Bo at our house! My mom is the resident champion! Ditto to Ruth's comment. 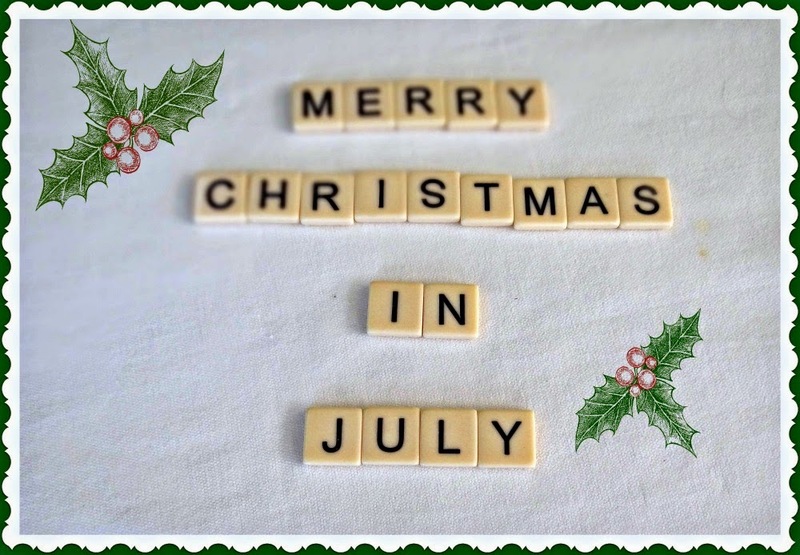 A fun post Michelle and I like the idea of Christmas in July. Oh I don't know, Michele. Does a gal ever give up wanting to spend time with a dear and doting aunt? I never have. What fun and I'm outting these ideas on my list. The grands love old school kinds of games where everyone can play. Hi Michele! Oh, what a sweet thing to do with and 'for' your little niece. Reagan is a lovely young lady and you are helping her to store up some wonderful memories with you! Your china is so pretty and love how you've set your little tables. I'll have to remember those games! Thanks for popping in to see me. 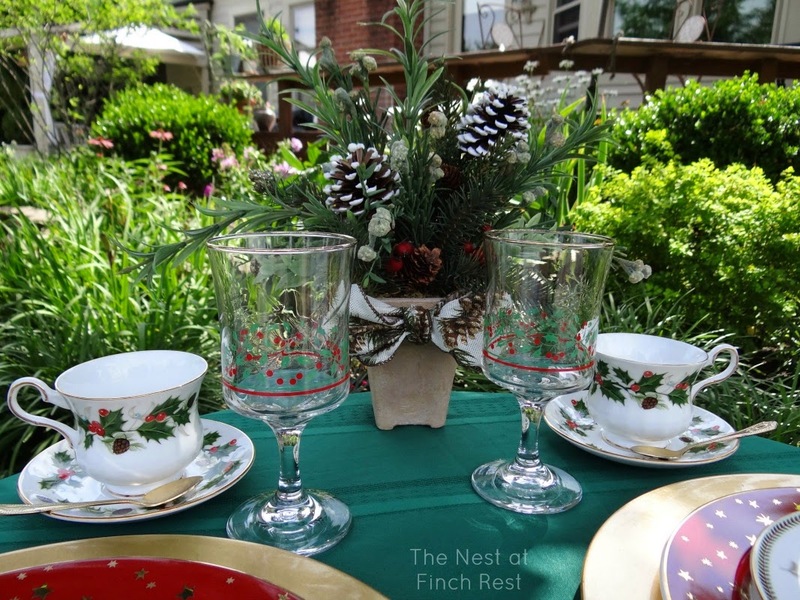 What a lovely Christmas tea setting. It looks so festive and fun. I bet you both had an amazing time enjoying the pleasures of afternoon tea. They do grow too fast and after that, they find these sort of things boring. But how sweet that you were able to share such a lovely day with your niece. So pretty! This makes me long for the holidays.Enjoy your niece, she's a beauty! This is such a sweet post..just love it. 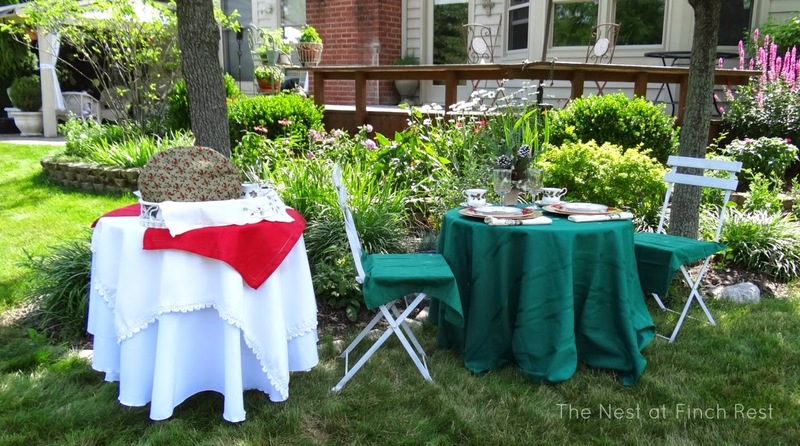 Garden Party Entertaining -Emporium Style!